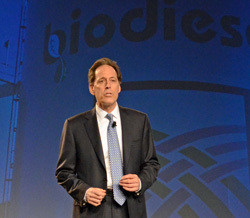 The Chair of the National Biodiesel Board is Steven J. Levy, Sprague Operating Resources LLC. This is his first conference as the Chair so when he spoke at today’s general session he told a little bit about himself and his background. He’s the first NBB Chair who is not a farmer, producer or from the Midwest. Steven spoke about the work of the National Biodiesel Board and the challenges that it will overcome by being a unified voice for the industry.